Kong: Skull Island is an upcoming American monster film directed by Jordan Vogt-Roberts and written by John Gatins, Dan Gilroy and Max Borenstein. 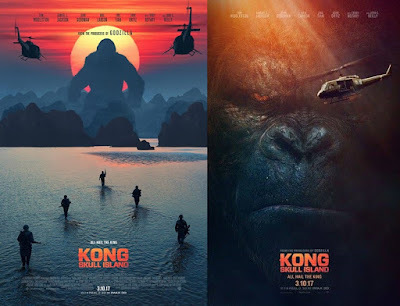 The film is a reboot of the King Kong franchise and will serve as the second installment in Legendary's Godzilla–Kong film series. It stars an ensemble cast consisting of Tom Hiddleston, Samuel L. Jackson, John Goodman, Brie Larson, Jing Tian, Toby Kebbell, John Ortiz, Corey Hawkins, Jason Mitchell, Shea Whigham, Thomas Mann, Terry Notary, and John C. Reilly. Principal photography began on October 19, 2015 in Hawaii. Kong: Skull Island is scheduled to be released in the United States on March 10, 2017 in 2D, 3D and IMAX 3D. In the 1970s, a team of explorers is brought together to venture deep into an uncharted island in the Pacific as beautiful as it is treacherous—unaware that they are crossing into the domain of the mythical giant gorilla known as Kong.